Oh I we do love Autumn!!!! 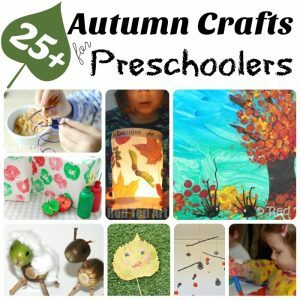 I think I have gushed about Autumn and Autumn Crafts for Kids in a number of posts now… but I still can’t get enough. We love conkers, acorns, sticks and pinecones. 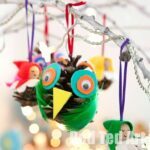 We drag them all home and then we get crafty… A pinecone craft can be a little tricky – as the there is little “surface area” for sticking things on and they do have a tendency to fall over a bit like a weeble (though that stands up again). 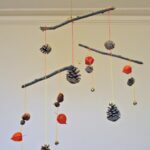 So I set myself a task to create more kids pinecone crafts! 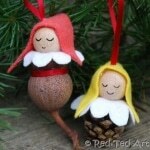 Inspired by little waldorf dolls, I think these are adorable. And relatively easy to make! 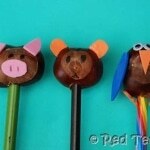 1) Make little heads – they look tricky, but they are not. 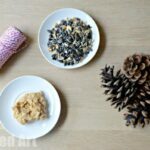 And they have the benefit (over wooden beads), that you can easily glue them onto the pine cone with PVA glue (and they are light). 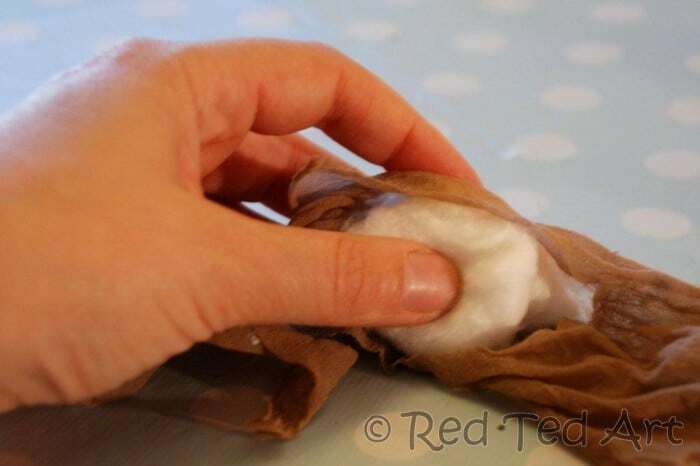 Take two pieces of cotton wool and place them inside two layers or tights. 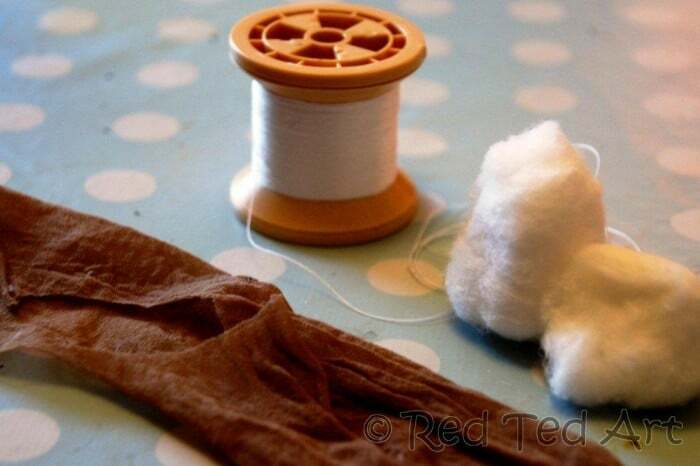 2) Wrap the tights round to form a ball. Secure with a little thread and trim. 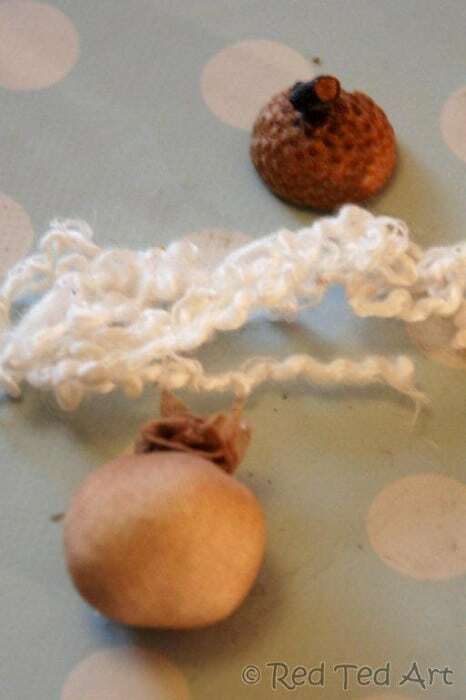 3) Hair and hat: cut some strands of wool. Glue them over the nobbly bit of your hat with plenty of PVA (may be a little messy). 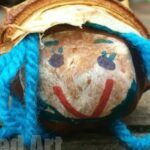 Add lots of glue inside your acorn beret and squeeze on top of the “knobbly” end of your head to hide it all. 4) Take your pinecones and see which ones stand upright best. Bend down the top few “needles” (you may have to break them a little to create a platform for the head. Add lots of glue to the bottom of the head and squeeze on. 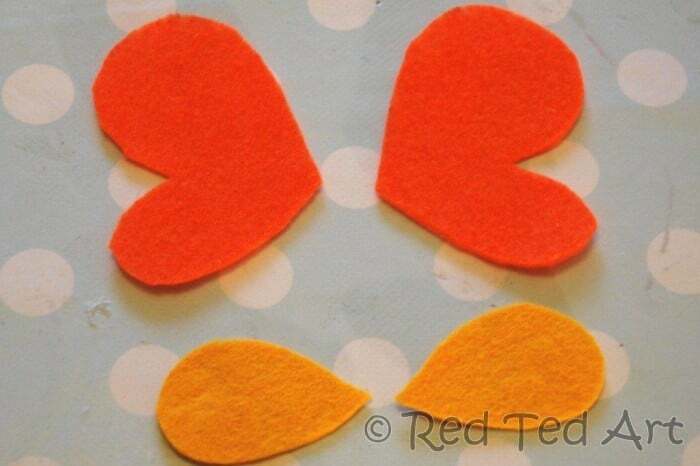 5) Decide on fairy wing shape – we made ours butterfly-esque. 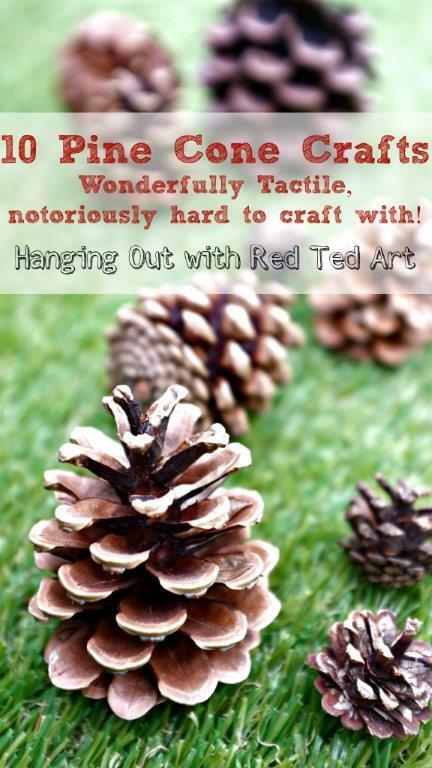 Glue pieces in place and then with a big dollop of PVA squeeze into your pinecone “needles”. If need be, push into place with a craft stick or a pair of scissors. 6) Done… thought whilst everything is drying, do check it every so often and make sure that head is still in the right position. Get carried away and make more and more and more and PLAY! 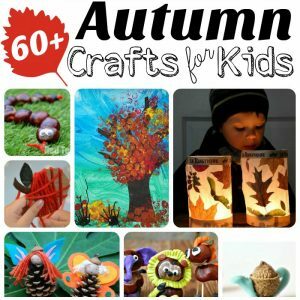 And check out our complete list of Autumn Crafts for Kids! Super adorable! I think we need some to adorn our nature table! Will have to give it a try! And Chelsea, I do hope you make some! They us smile whenever we see them! Ness – much appreciate the Pin and adding it to your bucket list!!! Love those little fairies! Simply adorable. Glad you like the Jen! Mary – if you do make some, would LOVE to see some pictures!!! Now these, I would LOVE living at the bottom of the garden! So sweet. Liz – I thought you may like these!! 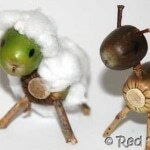 Adele – oooh I love the idea of the wool. How lovely! may just adorn our nature table with a few! They would be SO lovely on a Nature Table!! 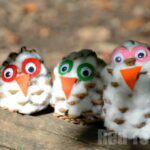 Oh such a cute Fall craft- my daughter will adore this. Popping by from “For the Kids Friday”…come say hi over at http://thehandleyhome.blogspot.com/2012/09/bee-wrapping-paper.html…this week I’m linking up some cutesy bee wrapping paper. Love the blog- thanks for sharing!! Okay, these are adorable! I can’t imagine a little girl not loving these. What a wonderful fall project. Just pinned! Oooh you could have a whole Fairy population Kerry! Helen – thanks for the invite, will pop by! Vicky! Hurray! Hope you make lots and thank you for pinning!! These look super cute, but I just know I’d end up doing it all, and the kids wouldn’t have the patience. They current can’t cope with anything involving glue that you have to wait on! It’s cello tape all the way! They can just about cope sticking tissue paper on things, as it’s so light it doesn’t fall off before dry. 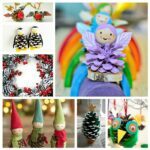 Have you done a selection of crafts that don’t need glue, or if they do, it’s glue to stick something flat, so it’s not going to fall off whilst you continue and the glue isn’t quite dry yet….. If not, have that selection idea for free! I hear you! If you dare, you could use a hot glue gun for these. Alternatively.. MAYBE… you could use a wooden bead – use a toothpick at the centre of the bead and somehow wedge it into the top of the pinecone? I have tried it… but just thinking out loud? The wings were fine, as we “wedged them with glue between the pine pieces”. Oh Molly would love these. Today is looking nice, I think we’d better go find some autumn things to get crafting. 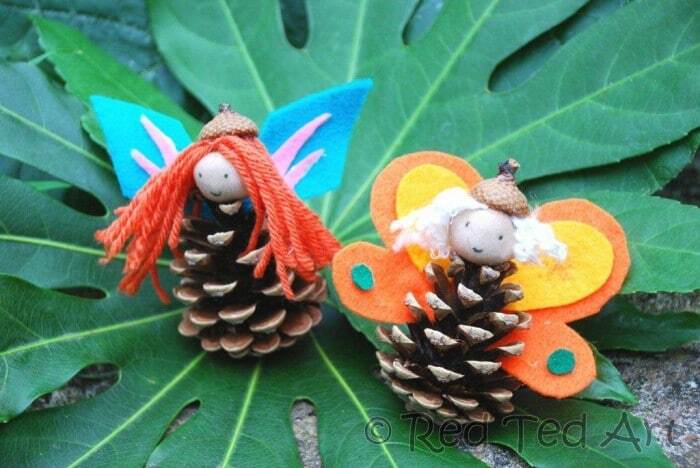 Love your pine cone fairies, perfect! 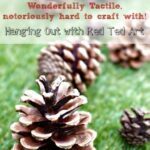 You’ver earned yourself a feature on Craft Schooling Sunday! I love these so much! They would be a perfect addition to our fall nature table. Thank you for linking up to Discover & Explore this week- these are just lovely! Brilliant! Hope you make some! Your pictures are gorgeous!! May I know which camera you use?